A bat that’s afraid of the dark? Think about it. This certainly causes problems, as bats spend most of their time in the dark! Brady is supposed to sleep in a dark cave and come out to play at night, but he is terrified. 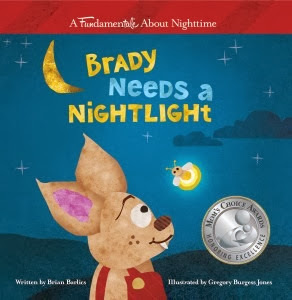 This book is the first in a series called Fundamentales, short stories meant to “give life to the exciting new discoveries and interpersonal challenges that children face.” Written by Brian Barlics, a pediatrician, Brady Needs A Nightlight won a Mom’s Choice Award for Excellence. I enjoy reading rhyming books to my kids, as the rhythm makes it fun for me. The colorful pictures of bats hanging upside down cuddling their teddy bears and then flying through the night make this book visually appealing as well. My kids could relate to Brady’s feelings about the dark and they were excited when Brady solved his problem with some help from his friends the fireflies (although my kids insist they are actually called “lightning bugs”! If your children are afraid of the dark, this book is helpful in providing a relatable character in Brady the bat. And if they are not afraid of the dark, they will still enjoy this loveable story about a bat who has a fear that he is able to overcome. If you are interested in winning a copy of this book, come back on Monday, as I’ll be including one in my January giveaway! Thank you to TLC Book Tours for providing us with a copy of this book to review, as well as one to giveaway!